Bring the Lights is just under 30 minutes of feel-good electro-acoustic music with a dose of post-rock gently stirred into it. Though light, it gains a lot of depth through its excellent production work. If your tastes run to shiny, infectiously toe-tapping music, this the place for you. Glockenspiels ring out bright notes, guitars pluck and strum away delightfully, and suddenly you want to be out in a field on a sunny day, spinning around for no reason. This is especially true on the closing track, “Water & Us,” which ramps up to an almost carnival-like feel, big and happy and carefree. 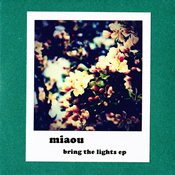 The trio (Tatsuki Hamasaki and Mayumi and Hiromi Hasegawa) can get pensive as well, hitting that with the slow and lovely shoegaze sigh of “Paper On You.” Bring the Lights is a delicious appetizer of an offering, short and sweet and perhaps leaving you wanting more. I like it in a mix where its sudden brightness shines a little better than it does on its own. Still, it’s been fun letting it roll through a few times in a row. Definitely worth checking out, especially if your spirits need a little uplifting. Available from Sounds in Silence.